Everybody knows a roof replacement in Denver isn’t cheap — and if it is, you may be getting your services from a less-than-qualified roofer. You should only want a reliable roofing crew working on your home or commercial building’s roof, but you should also want to choose a roof replacement solution that is most cost-effective for you. That’s why in today’s blog post, we’ll go over how you can make your roof replacement in Denver more affordable. At Endeavor Exteriors, we offer high-quality roofing services to Denver and surrounding communities, including Cherry Creek, Westminster and more! Whether you need a simple roof repair or a full roof replacement, we can tackle your project with ease and efficiency. Contact us today to schedule a roofing service. 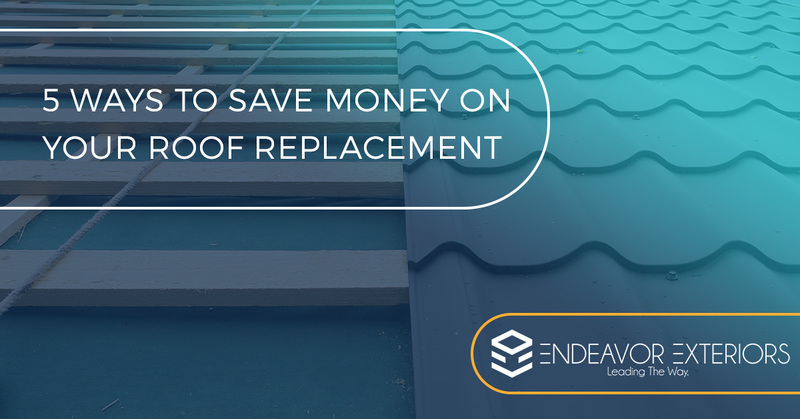 Continue reading below for our five tips on how you can save money when seeking a roof replacement service. 1. Make sure your roof needs an actual replacement. Before you commit to a full-on roof replacement service, make sure your roof doesn’t actually need a roof repair service instead. Sometimes you might think a reoccurring issue with your roof is something that indicates you need to replace it, when really, you just need to have a professional roofer scope it out and look for simple repair solutions instead. Don’t just blindly choose the first roofer you come across — understand your roof in its entirety, and know the exact roofing materials you want before talking to roofing contractors. Also, shop around and get different roof replacement estimates from a variety of roofing companies to ensure that you’re getting the best deal. 3. Don’t be afraid to shop around. As we mentioned above, don’t be afraid to reach out to a lot of different roofing contractors in your community and ask for estimates. You don’t have to commit to a roofer just because they were the first one you talked to — you have the right to shop around. However, you should always be cautious of roofers that give you extremely low quotes for roof replacements, as this could mean these roofers will do a suboptimal job and use suboptimal roofing materials. Most roofing companies are busiest during the summer and fall seasons, meaning most will jack up their prices during this time period. If you opt to get your roof replacement during the off-season, you could reap discounts or lower price quotes. 5. Look at your insurance options. If your roof needs a replacement because it was damaged and not because you neglected it, reach out to your insurance company. It could help pay for some (if not all) of your roof replacement project. No matter what roofing services you might need for your home or commercial building, our team at Endeavor Exteriors has you covered — including high-quality, one-of-a-kind roof replacement services. Between our innovative digital experience and exceptional customer experience, we’re changing the way people view the roofing industry — and for the better. If you’re ready to schedule a roof replacement service in Denver or surrounding areas, reach out to our team today. You can reach us by calling (720) 464-3472 or by completing our online form.